ST. LOUIS (AP) — Even with ample reason to think about what might have been, Paul Azinger prefers to wonder what’s next. This was one time he reluctantly agreed to celebrate the past. He returned to Inverness Club over the weekend, his first time at the Ohio club since he reached the pinnacle of his career 25 years ago. He never imagined then that his golf would never be better. 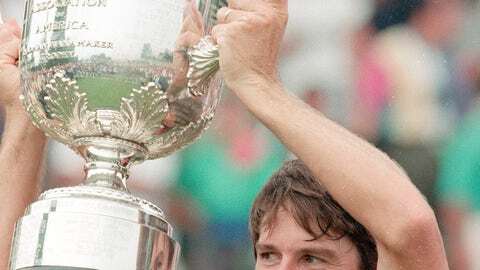 Azinger won his only major at the 1993 PGA Championship with four birdies over the last seven holes for a 30 on the back nine, eliminating the likes of Nick Faldo and Vijay Singh, Tom Watson and Hale Irwin, and then beating Greg Norman on the second hole of a sudden-death playoff. All five are in the Hall of Fame. The celebration 25 years ago didn’t last long. His right shoulder had been bothering him that year. Orthopedic surgeon Frank Jobe called him Friday night during that PGA Championship to say results from a bone scan were in and it didn’t look good. Azinger asked if it could wait until after the Ryder Cup. Finding calm in a storm, he won the PGA Championship. Finding the fight that enabled him to win 12 times on the PGA and twice more in Europe, he battled Faldo to a draw in Ryder Cup singles during a U.S. victory in England. And then he was told he had cancer. The diagnosis was non-Hodgkin lymphoma, which required six months of chemotherapy and radiation. How long would it have lasted? He’ll never know. Even with his best golf behind him, cut short by the invasion of cancer at 33, Azinger still managed to leave a mark in golf. He still does. He always wonders what’s next. Azinger won for the last time in 2000, a seven-shot victory at the Sony Open that was best remembered for the long putter he stuck into his belly. That was what first brought attention to a new way of putting. A generation later, when Keegan Bradley at the PGA Championship and Webb Simpson at the U.S. Open won majors with the belly putter, the governing bodies decided to ban the anchored stroke. He also made it back to another Ryder Cup team, primarily off the strength of that victory in Hawaii. Even though he was No. 22 in the standings, Strange picked him. And then the matches were moved back a year because of the Sept. 11 terrorist attacks, and Azinger had fallen outside the top 50 in the world. He went 0-1-1 for the week, yet both matches were memorable. Azinger and Tiger Woods combined for a 63 and still lost when Thomas Bjorn, after Azinger had hit 7-iron to 5 inches on the 18th hole, made a 20-foot birdie to pin. In singles, with the Ryder Cup very much undecided, Azinger was 1 down to Niclas Fasth and in the bunker left of the 18th green. Europe wound up winning when Paul McGinley made the winning putt against Jim Furyk. That started a run of European dominance that was stopped by Azinger, who brought a maverick way of thinking to the matches when he was appointed captain. Azinger demanded an overhaul of the points system and asked for four captain’s picks instead of two, a model now in place. He also broke his team into three units and, using personality models, allowed players who qualified for the team to choose the wild-card selections. The U.S. won that year at Valhalla in 2008, and Azinger’s model was cited by Phil Mickelson when he criticized Watson after the 2014 loss at Gleneagles, which led to players having more control. The Americans won the next Ryder Cup, and the U.S. team now looks strong as ever. If it’s not Azinger’s system, his fingerprints are all over it. Does he get enough credit for it? Maybe in some corners. Azinger really doesn’t care. Twenty-five years ago, he had reason to believe he would have won a lot more, even more majors. He might be in the Hall of Fame now, just like the players he beat that day at Inverness. The trip to Ohio allowed him to look back, and he found only happy memories. “I’ve had an exciting life,” he said.